These tiny sucking pests can quickly wreak-havoc on indoor and outdoor gardens. 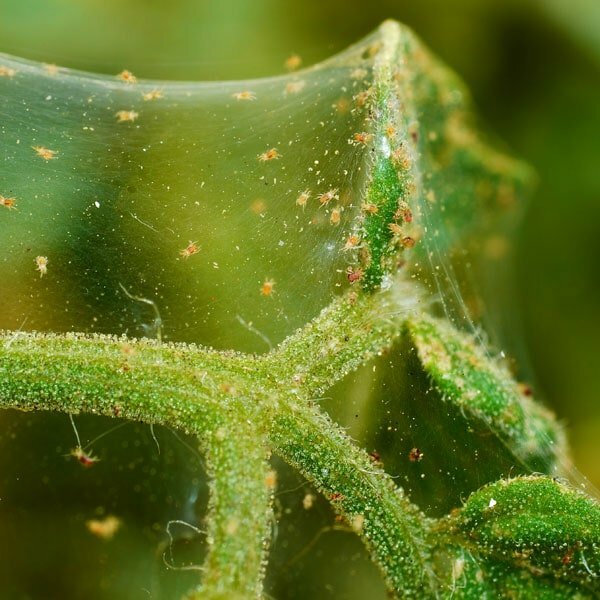 Here’s the natural, organic way to get rid of spider mites FAST! Note: Spider mites are wind surfers. They disperse over wide areas riding their webbing on the breezes. Careful containment and disposal of infested plants is crucial. On annual vegetable crops — such as squash, melons and watermelons — loss of leaves can have a significant impact on yield and lead to sunburning. On crops such as sugar peas and beans, where pods are attacked, spider mites can cause direct damage. On ornamentals, mites are primarily an aesthetic concern, but they can kill plants if populations become very high on annual plants. Spider mites are also important pests of field-grown roses. Use the Bug Blaster to wash plants with a strong stream of water and reduce pest numbers. On fruit trees, horticultural oil should be applied early in the season or late in the fall to destroy overwintering eggs. Dust on leaves, branches and fruit encourages mites. A mid-season hosing (or two!) to remove dust from trees is a worthwhile preventative. Tip: Management strategies must take into account the fast development time of this pest, especially during warm weather when eggs are laid continuously. Just targeting the adults will do little good if eggs and larvae survive. Repeat treatments are almost always necessary. The use of leaf shines and washes helps control and prevent further infestations.